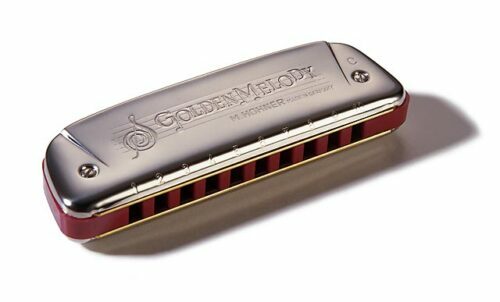 The Hohner Golden melody is an attractively styled model, fifties-look, with full length covers, closed at the sides. The Golden Melody is the only Hohner Richter harp featuring equal tempered tuning (12TET) which makes it especially suitable for jazz and melody playing in all keys and ensuring its lasting popularity among jazz and melody players including world renowned overblow specialists Howard Levy and Carlos del Junco. Categories: Harmonicas, Diatonic Harmonica, Manufacturer, Hohner. Tags: Diatonic, Golden Melody, Harmonica, harp, Hohner.